This almond cake recipe is adapted from Tara Stevens, a chef and cookbook author, currently living in Fez, Morocco. Food & Wine Magazine did a feature article on her this month, and included the recipe. Perfect for breakfast or dessert, this marzipan-like dense cake is her delicious signature dish. Butter the bottom of a 9” springform cake pan and place a sheet of parchment paper on the bottom and up the sides about 4”. 1. Whisk together the flour, baking powder, and salt in a bowl; set aside. 2. Cut the strawberries into bite-sized pieces and mix the all berries together. Drain the liquid completely. Reserve 1/3 of the berries in another bowl to decorate the top of the cooled cake. 3. Put the sugar and eggs in a large bowl. Using a hand-held mixer, whip at medium-high speed about 12 minutes until the mixture is thickened and glossy. 4. Gently fold in the almond flour with a rubber spatula, 1/3 at a time; alternate with 1/2 of the berries, ending just when the last of the flour is incorporated. 5. Pour the mixture into the prepared cake pan. Bake for about 55 minutes, until center is clean when a toothpick is inserted. 6. Cool the cake pan on a rack for 10 minutes. Gently remove the pan and let cake cool on the parchment paper. 7. Transfer to a serving plate and add remaining berries on top. 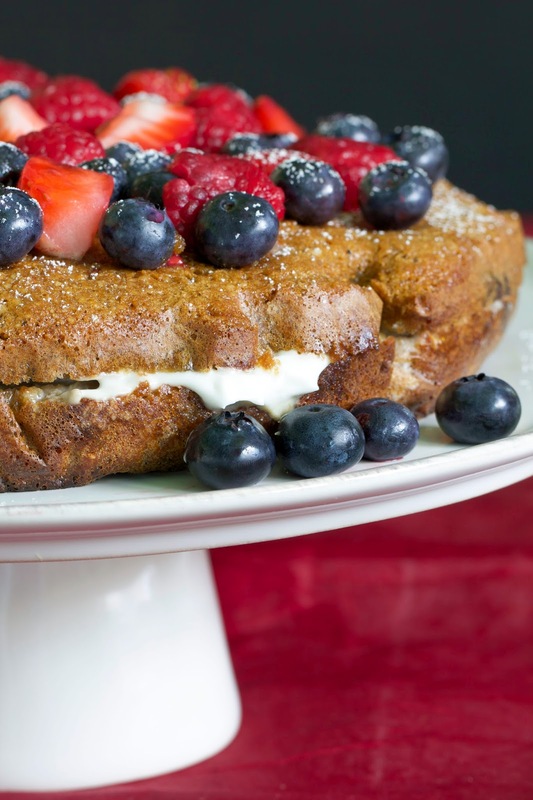 Sprinkle berries with confectioner’s sugar. Serve coconut whipped cream (optional) on the side for best results.